Snorkeling provides a perfect way of exploring the underwater world. It is a popular recreational activity, especially in tropical locations. Snorkeling allows you to observe underwater life in its natural setting without expensive and complicated equipment used in scuba diving. Both adults and children can engage in this underwater activity as it doesn’t require as much activity and training as scuba diving does. As a beginner snorkeler, you may need to know the difference between snorkeling and scuba diving. Snorkeling and scuba diving share a few basic similarities. For instance, both activities require a snorkel, mask, and fins. They also provide you with a good opportunity to explore marine life in its natural setting. However, in scuba diving, you have to go deeper to get an uninterrupted view of the seabed while breathing via an oxygen tank. In scuba diving, the entire body of the swimmer is immersed deep in the water with the nose and eyes enclosed in a mask. The diver does not breathe through the nose unless he or she is wearing a mask but inhales from the diving equipment’s regulator mouthpiece. In snorkeling, the head and nose are underwater and the swimmer returns on the surface regularly by tilting the head back to expel water from the snorkel tube. Scuba divers can stay underwater longer than snorkelers because they don’t have to hold their breath. Snorkelers hold their breath while underwater and have to come back to the surface regularly. In scuba diving, you need a pressurized gas tank strapped on your back, a single hose, a diving regulator, mouthpiece, tight-fitting diving suit, and swim fins. Snorkelers just need a diving mask, an L or J shaped tube with a mouthpiece and swimming fins attached to the feet. Scuba diving is not only more complicated than snorkeling but requires more equipment and skills too. All in all, both activities provide a great opportunity for underwater adventure. It is beyond the scope of this beginner’s guide to snorkeling to cover all the different types of snorkeling gear on the market today but a brief description of the snorkel and the face mask will be quite helpful. A snorkel is basically a 1-foot long tube with a diameter of around 0.6 to 1 inch shaped like letter J or L. it is made of either plastic or rubber and comes with a mouthpiece attached to one end. The snorkel is used for breathing air from the water surface while the wearer’s mouth and nose are submerged in the water facing down. Snorkeling is fun but can be uncomfortable for a first time snorkeler using the traditional snorkel mask. As a beginner, you’ll find it a challenge at first to breathe through a snorkel. Rental snorkel gear set or tubes not only feel unhygienic but can be leaky or foggy too. The solution to these challenges is a face snorkel mask. The full face snorkel mask covers your face and allows you to breathe underwater just as you would on land with your nose and mouth. Unlike the traditional snorkeling gear in which the mask and snorkel tube come separately, the full face snorkel mask incorporates the mask and snorkel in intelligent design. It makes breathing easier and quite natural and even comes with a valve that automatically closes once you submerge your head back into the water to prevent water from entering the breathing tube. The full face snorkel mask gives you a wide 180-degree field of view and a clear vision while snorkeling. Some models even feature GoPro mounts that you can use to attach an action camera and record wonderful underwater scenes. If you are starting out on snorkeling, get a full face snorkel mask to make things easier. The most important tip to successful snorkeling is to be relaxed in the water and avoid over-analyzing everything. Just like you did when you learned to ride a bike or drive a car, practice snorkeling more often and you’ll soon be comfortable in the water. Here are a few more basic tips to make your snorkeling adventure more fun and less challenging. The first thing you need to do is to check your mask, snorkel, and fins and ensure that they fit properly. A mask or snorkel that doesn’t fit properly will definitely ruin your snorkeling experience. The last thing you want is bubbles or sea water seeping into your mask and causing you to panic. If you are renting or buying the equipment, test the mask by holding it onto your face and breathing in via your nose. If it does indeed seal perfectly and holds in place by itself, that’s a perfectly fitting mask. Avoid a mask that can easily fog up. It is important to get one that doesn’t leak. You can also take time to learn how to defog the mask and how to clear it when it fills up with water. Go for a dry snorkel or at least one that comes with a splash guard to avoid water flooding into the snorkel. 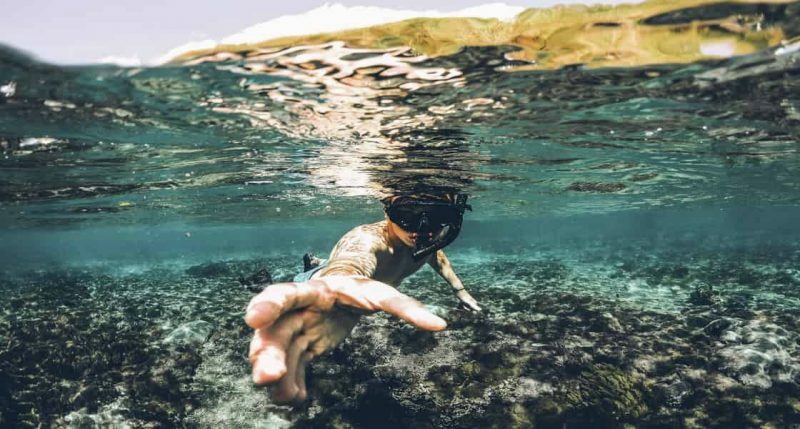 A dry snorkel has a handy valve that automatically seals when the snorkel is immersed in water, especially when you come across a small wave or tilt your head to one side. It also features a special purge valve that helps to blow water out of the snorkel tube. For beginner snorkelers, a dry snorkel is highly recommended although it may come with additional rental costs. In as far as fins are concerned to find a pair that’s neither too loose nor too tight. It obviously shouldn’t hurt while in use. You don’t want your fins falling off when you are swimming underwater. If they fit too tight, they may cause blisters or give you sore feet. A snug fit is, however, recommended as your feet will shrink a bit in the cool water. Make sure the fins fit properly and comfortably. Most importantly, don’t go snorkeling for the first time without fins. They are critically important for your safety and will save you lots of physical strain while swimming. Don’t forget to wear a rash guard or t-shirt, especially if you plan to go snorkeling for a full day, to avoid sunburn. You can also lather a biodegradable SPF but avoid using sunblock as it can damage the reef. The next step, after ensuring your equipment fits properly is to do a test run in a pool. The simple exercise will help you get used to breathing in and out of a snorkel. Try snorkeling in a swimming pool to get used to the equipment and the underwater feeling. If you feel comfortable doing the test run on a beach, start by swimming around the shallow end before delving deeper. With good practice, breathing through the snorkel becomes easy and comfortable. Ensure the top of the snorkel is always afloat and if water seeps in, you will easily blow it out. Practice makes perfect so keep on practicing until you can comfortably use the snorkeling equipment in the deep end. A question asked by most beginner snorkelers is, how deep is snorkeling water? Well, snorkeling can be done in almost any body of water deep enough to submerge. However, most snorkelers prefer places with warm water, minimal waves, and interesting marine life near the surface. Shallow reefs with sea level ranging from 3 to 13 feet are good for beginner snorkelers but as you become more accustomed to the activity you can venture to deeper reefs. However, you can’t dive too deep due to snorkeling limitations such as repeated breath-holding and the required skill and fitness level. Remember that increased depth increases breath-hold duration and risk of suffocation. Stick to shallow reefs as a beginner. Don’t just pick on any snorkeling spot just because you saw it mentioned on the web. Take time to inquire about the ocean conditions in that area. Learn about the region’s ocean currents, waves, and typical surge. More importantly, avoid random snorkeling as a beginner by jumping off the boat at the first seemingly cool reef you come across. That’s dangerous and could ruin your maiden snorkeling experience. Find a calm area that’s also rich in marine life. Safety should be a top priority so a beach with a lifeguard around is a good spot to experience your first snorkeling adventure. Must you learn to swim before you can go snorkeling? Well, the truth is that a majority of snorkelers are good swimmers but you don’t necessarily have to be a great swimmer to do snorkeling. If you can keep in mind the basic snorkeling rules and learn to be careful as you move through the water, you can enjoy your snorkeling adventure regardless of your level of swimming expertise. However, it is recommended to learn how to swim and refine your skills before you go snorkeling, especially if you plan to dive a little deep underwater. As a beginner, you’ll at first experience fear and lack of confidence if you are not a good swimmer but don’t let it kill your morale. You can still enjoy the experience whether you are a confident swimmer or not. As a beginner snorkeler, expect to face a conflict of emotions from buoyant excitement to nervousness. It is even worse for non-swimmers who are not conversant with propulsion techniques in water and the fundamentals of staying afloat. It is important to maintain buoyancy in any water activity including snorkeling so if you can’t swim, then invest in a personal floatation device. There are many types of swimming aids and snorkel vests on the market today. These devices are designed to improve buoyancy and keep your body afloat while snorkeling. Some of the most common floatation devices include the snorkel vest, preserver or life jacket, floatation waist belt, cork jacket, floatation suit, noodle tubes, water wings, and many more. A floatation device helps to keep your head above the water surface enabling you to rest and recover from exhaustion. Remember that even the best swimmers use floatation devices to retain energy and rest when they get tired. The devices are not just worn by snorkelers but boaters, long-distance swimmers, and surfers as well. They provide convenience and protection for every type of water activity. They are available in bright colors such as fluorescent yellow or orange which can easily be seen from a distance. There are different PFD sizes to suit people of different body sizes and statures. The snorkeler’s vest is highly recommended for non-swimmers who want to try snorkeling. We highly recommend going for your first snorkeling in the company of competent swimmers, especially if you are a non-swimmer. Buddy teams in snorkeling have at least 3 members who are experienced in this type of underwater activity. Two members always swim and stay in the water while the third member monitors them from the shore or aboard the boat. Snorkeling buddy teams involving children or young teenagers should always have one or two adults carefully monitoring the young snorkelers. It is important to always have one member of the team watching from the boat or shore just in case something goes wrong. As they say better safe than sorry, especially for beginner snorkelers who are not good swimmers. You should always go snorkeling in a team of no less than 3 experienced snorkelers. The best snorkeling spot for beginners and non-swimmers should not necessarily be one with a diversity of active marine life. It should rather be a place with calm water conditions that don’t require advanced swimming skills. We highly recommend joining a snorkel tour activity in your first attempt. The tours are well monitored and managed by competent guides who can handle any water activity related accident. Find a good tour operator who provides snorkeling tours for children and beginners. There are many supervised snorkel tour operators who cater to non-swimmers and families who want to have fun snorkeling. One of the greatest dangers that snorkelers face regardless of their skill level is inshore crafts such as speedboats and ski jets. This is because the snorkeler is always submerged in water with only a small section of the snorkel tube visible above the surface. Some of these leisure and inshore crafts ply around the same spots where snorkelers visit. This creates a high potential for accidental collisions. Sailboats are dangerous too because they have quiet propulsion systems which are not loud enough to alert the unsuspecting snorkeler of their presence. You could easily surface under a sailboat and suffer a serious collision. It is therefore advised to snorkel in less crowded areas that are specifically demarcated for snorkeling activities. Some of these areas are marked by buoys to warn speedboats and ski jet users. You can also wear bright reflective colors or use dive flags to warn boaters plying in the same area where you are snorkeling in. If you go snorkeling near coral reefs, take care to avoid coming into contact with the delicate coral. The sharp coral sometimes stings and can contain poisonous inhabitants. To avoid coral injury, put on protective gloves while snorkeling and avoid interfering with the underwater environment. In the unfortunate event of suffering coral scrapes, cuts, or other injuries, look for first aid and emergency medical treatment later to avoid infection. Avoid any direct contact with boulder corals which are quite fragile and help to conserve marine life. Q. How do you defog? A. It is critically important to learn how to defog in snorkeling. What would be the point of snorkeling if you cannot see anything? There are many ways and materials you can use to defog. For instance, good defogging materials you can use with ocean water to defog on your lenses include crushed leaves, gel products, or a drop of Johnson’s Baby Shampoo. Q. Can you suffer dehydration while snorkeling? A. Yes, it is quite possible to suffer dehydration while snorkeling. In fact, it is recommended to hydrate well before you hit the water, especially when you plan to be in the water for a long time. Hydrating properly helps to avoid cramps. Q. What’s the best place to practice snorkeling? A. You can practice in any water body that you feel comfortable with. Most beginners practice in shallow lakes or swimming pools where they are comfortable or safe in the company of more competent snorkelers. Q. How do you avoid sunburn without using sunblock? A. The snorkeler’s back, thighs, and ankles can be exposed to the sun for a long time and even burn seriously despite being submerged in water. To avoid sunburn, wear a t-shirt, wetsuit, or a rush guard with SPF. You can also use a waterproof sunblock that doesn’t harm the marine environment. Q. What is the best time of the day to go snorkeling? A. You should only go snorkeling when the waters are calm. This is usually in the morning hours. Going into the ocean when there are waves will definitely ruin your first time snorkeling experience. Violent waves are dangerous and make it extremely difficult to use your snorkeling equipment. They reduce underwater visibility and can make you seasick. Go into the water when the sea or ocean is calm with waves reaching just 6 inches or less. Make sure you are accompanied by an experienced snorkeler and don’t let them talk you into venturing into areas beyond your comfort level. A beach with a lifeguard is highly recommended for your first snorkeling attempt. Snorkeling is a perfect way of exploring the blue underwater life. It doesn’t require as much training as scuba diving. You also don’t need a lot of complicated underwater breathing equipment. You just need to know how to move and breathe underwater to do snorkeling. The only training involved is how to use the snorkeling mask and move in water. There are also many scenic places with clear calm waters where you can enjoy exciting snorkeling adventures. Remember to always wear a floatation device when you hit the water. Your snorkeling gear should be made of materials that protect you from the sun and marine animals or insects. Snorkel in a buddy team made of competent swimmers. If you are a non-swimmer, stick to shallow areas where you can stand up if you get tired. Stay close to the shoreline or your support boat and always have someone supervising the group from the boat or at the shore.